B&P Littleford’s TriVolution® Compounder is a very distinct mixing machine that reciprocates the process screw 3 times for every 1 revolution. The flights interact with pins in the barrel much in the same way a continuous kneader does. The TriVolution® offers excellent dispersive and distributive mixing without damaging critical ingredients by its innovative mixing mechanism. Its controlled shear with enhanced material exposure is also well adapted for devolatilization and reactive processing. The TriVolution® mixer also establishes the highest standard of performance in shear sensitive mixing applications while achieving the highest energy efficiency. Recognizing the compounding industry's need for improved mixing technology, B&P Littleford has achieved what could have been considered impossible with Continuous Kneaders and Twin Screws. The B&P Littleford TriVolution® compounder is uniquely designed and has set a new industry standard by mixing higher quality material, faster and cheaper. 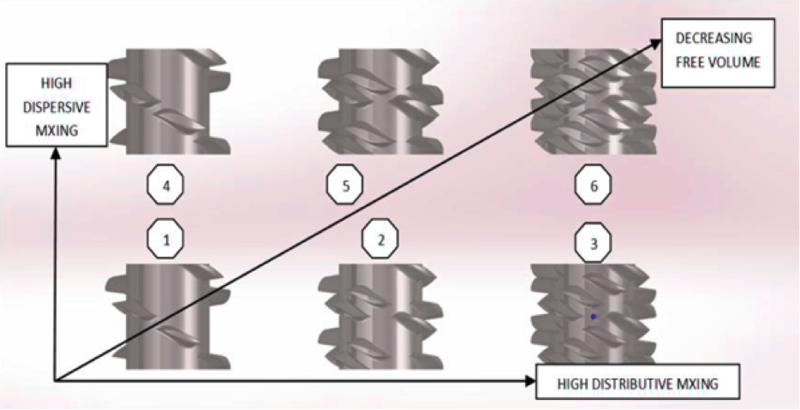 In Continuous Kneaders, three-rows of screw flights are available to interact with three pins located in the barrel wall. 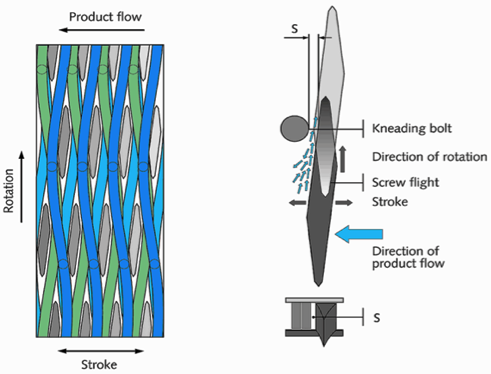 The flights of the screw are interrupted and, as the screw rotates, it also oscillates creating a series of shearing, stretching and folding actions (similar to taffy or dough kneading) that leads to excellent mixing of the product at low shear. The nature of the mixing action is relatively low-shear and thereby more suited toward thermoplastics and thermoset materials which are sensitive to heat and shear stresses. The machine can be configured to have between three and twelve rows of flights and pins. 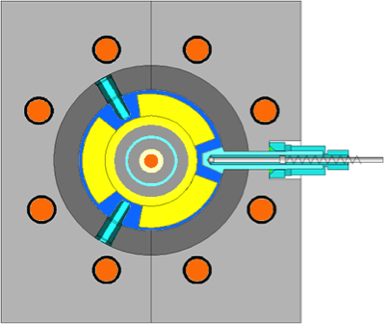 This presents a dramatic shift by augmenting the mixing processing window of the machine. 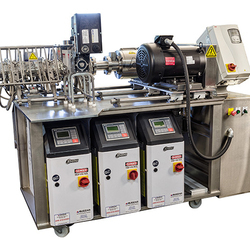 With up to twelve times the number of axial flow splitting regions of typical twin-screw extruders and continuous kneaders, the TriVolution compounder demonstrates just how good dispersive mixing can be. Distributive mixing is provided by continuous flow splitting between a greater number of pins and flights. This is further enhanced by specially designed kneading elements. The TriVolution compounder has consistently demonstrated distributive mixing far superior to its Continuous kneader predecessors. Higher throughput rates than the latest competitive Continuous kneaders. Reduced additive volume in formulation: The extremely effective mixing of the TriVolution Kneader often allows for reducing the concentration of expensive raw material additives. Less production floor space is needed. A smaller equipment footprint requires less floor space to be constructed or allows your existing mixing space to be used for other needs. Higher throughput at slower screw speeds reduce circumferential speed and lower the wear and tear inside the TriVolution Kneader. Lower energy consumption: Extensive testing at B&P Littleford’s Process Labs has shown that the TriVolution Kneader requires lower specific mechanical energy consumption for compounding and mixing compared to other competing technologies. The above are generally across-the-board benefits. There are other various benefits that may be specific to your formulations. For instance, we were able to achieve a considerably higher loading of carbon black into both PE and PET (virgin as well as regrind), while maintaining high quality yield, whereas incumbent technologies (Co-rotating twin-screw and continuous intensive mixers) lost dispersion after 50% loading. We are inviting plastics, rubber, chemical and food processors to bring some of the most challenging formulations to run on the TriVolution and discover the process performance improvements offered by it. You will get an empirical analysis of the mixing benefits that are inherent to the TriVolution. At B&P Littleford, we’ve been extensively testing TriVolution side-by-side with our twin-screw extruders and Ko-kneaders and in every case, we’ve been able to establish the above advantages processing on the TriVolution kneaders over and above the incumbent technologies. B&P Littleford is prepared and equipped to help you with your compounding and mixing needs. Take advantage of our experience and technology by contacting us to see what running the TriVolution kneaders can do for your process and bottom line.